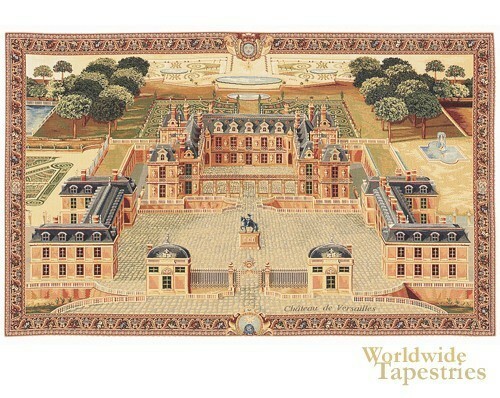 The famous chateau of Versailles is shown here in this tapestry, the work of Pierre Patel (1605-1676). The Palace of Versailles situated southwest of Paris was the court of political power during the reign of Louis XIV from 1682 until the time of the French revolution in 1789. Beginning as a hunting lodge, the grounds eventually was transformed into the palace we see here under the architect Louis Le Vau, landscape artist Andre Le Notre and the interior decoration under Charles Le Brun. The palace became the home of thousands of courtiers as well as the centre of the government offices. Here we see the intricate details of the Palace of Versailles in its stage of evolution in the mid 17th century. The elaborate gardens surrounding the palace is already seen to be developing. This tapestry "Versailles II" is backed with lining and tunnel for easy hanging. Dimensions: W 23" x H 14"
Dimensions: W 46" x H 27"